Today’s Woodburner Installation is an E cosy Panoramic 5 KW widescreen. This wood burning stove is proving very popular, however it’s not surprising. Many boxes are ticked with this woodburner. Despite its 5 KW size it has a huge screen. Furthermore, it’s SIA ready. This means it meets future and current regulations. Its a really up to date stove that is efficient. My customers did their homework and made a great choice. This woodburner installation went well. The Ecosy Panoramic stove needs to be 350mm from combustables. Because of this we remove the wood skirting and make good with plaster. The roof is good and solid. The sun is shining and it’s not windy! Ecosy Panoramic Log Burner Technical Information. 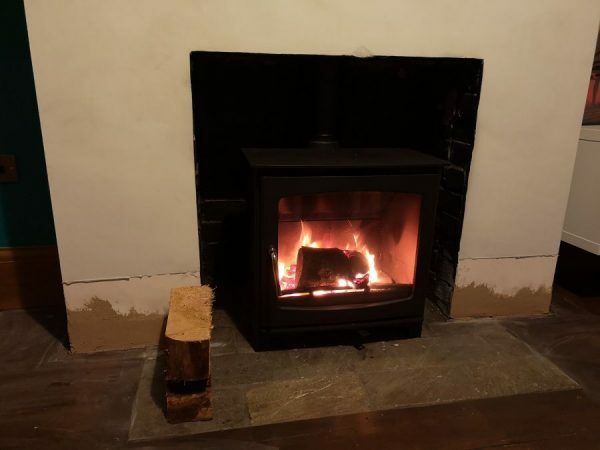 Ecosy Panoramics are slimline widescreen log burners. Besides this, the efficiency, coupled with a widescreen therefore make this a winner. Ecosy Slimline Panoramic 5kw – Performance Test as an illustration. Additionally also dependent on fuel used during operation. Nominal heat output kW 5.00 – No vent required for this Woodburner Installation. It spite of the large screen it’s an affordable log burner. A good Woodburner Installation that is going to make this home cosy. Additionally, in contrast to the price however, it looks more expensive than it is. In conclusion, buy one and basically you won’t be disappointed. Contact Glowing Stoves in Taunton, Somerset. Please call Glowing Stoves for a free survey. Furthermore, we offer free quotes in 2019. Let us carry out your Woodburner Installation. Despite having many upcoming bookings, we have dates available.